Between January and August 2015 alone, some 2,500 refugees have died trying to reach Europe. Aylan Kurdi is just one more statistic. It is easy to be cynical about the reaction the image of a dead child evoked as so many others have been conveniently ignored. 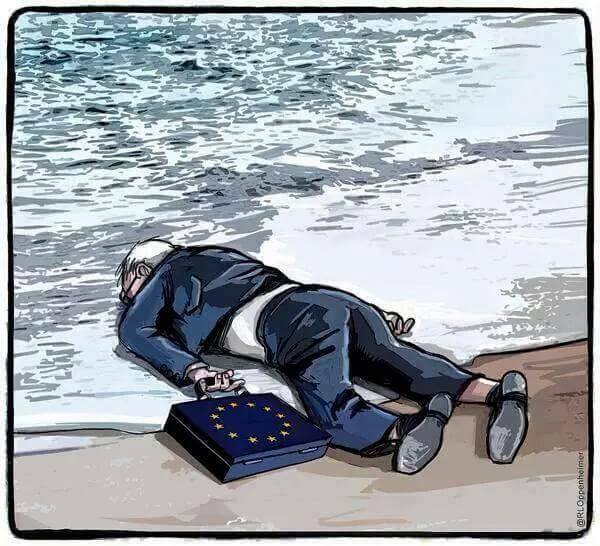 When I first saw the picture of dead Aylan Kurdi, it was hard to control my emotions, it seemed wrong to see this. I thought long about whether to share the photo on facebook, but Peter Bouckaert from HRW provided a good explanation why to remind ourselves and others (for a good counterargument see here). The little boy, dead on the beach, also reminded me of my son. Sometimes one image can be more powerful than a number–2,500. The real moral dilemma is not whether to share a heartbreaking picture, what to do next. Our failure, the failure of our governments, is enormous. We live in a fortress, where fellow human beings die after paying thousands of Euros or Dollars in freezer trucks and boats. Where refugees are escorted by police like prisoners, where refugees cut themselves to cross our fences. Their deaths lie on my, on all our conscience, for it is not due to people smugglers that these refugees have died, but because we erected barriers and tolerated the death at our borders. This is a defining moment for Europe. Now, this sounds pathetic, but if the counties of the EU do not change their policy, not just our governments, but us as the ones that elect them, will be responsible for more deaths. I have been encouraged to see the help many fellow Europeans have been providing from Serbia to Germany. Yes, we need to help, to welcome refugees, to provide for them in their need, but we also need to send a clear message to our governments that we want a different Europe: one which provides shelter, that is a safe haven so that nobody will die trying to escape. While achieving this will not be easy, the goal has to be clear. Lebanon with just 4.5 mio inhabitants hosts 1.3 million refugees, while the EU, more than 100 times larger, claims to be struggling with fewer. However, it is not just a question of humanity, but also what kind of Europe we want. Those who talk about the threat of foreigners, about “swarms” of refugees or the threat to ‘Christianity‘ have been screaming louder, but I don’t want to live their Europe. I fully agree with Max Fisher who noted that “If we want Syrian children to stop dying in the Mediterranean and washing up on Turkish beaches, we have to start with examining ourselves, our sense of our own cultural identities, and why we feel it’s so important to exclude foreign refugees in order to protect those identities. That’s a really difficult thing to do.” Yes, we have to a discussion of what kind of Europe we want. I want one which welcome people who are different than we are, not one governed by fear, fear of mosques, fear of people looking different. In many different ways, we need to be loud, make this message clear. Please join in signing a petition to EU governments to secure safe and legal entry to Syrian and other refugees here. Reblogged this on dr. costamagna.